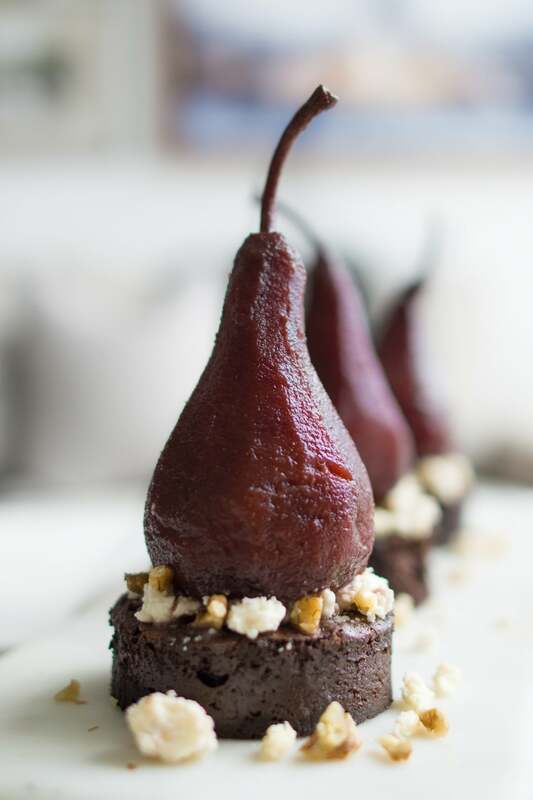 Port Poached Pear Chocolate Cake served with Dragon’s Breath Blue Cheese is a balanced harmony dessert that will impress any guest, or simply finish off a meal with elegance. Disclaimer: This post was sponsored by Dairy Farmers of Canada in partnership with Food Bloggers of Canada. All opinions are our own. Chocolate cake is one of those foundational recipes that every home cook and chef should have up their sleeve. A staple in our kitchen, our flourless chocolate cake recipe is a gem not only because it mimics a comforting brownie but because it literally take 5 minutes to make and 30 minutes to bake. The outcome is a fudgey, rich and decadent chocolate cake (insert heart eyes emoji). In celebration of our second Cheese of the Month Club with Dairy Farmers of Canada, we were challenged to pair two of our favourite things: chocolate and cheese. And so we married the two and presented them as the ultimate power couple with this Port Poached Pear Chocolate Cake and Blue Cheese dessert. This month’s Cheese of the Month comes to us from The Dutchman’s Cheese Farm located on the shore of the Bay of Fundy. Dragon’s Breath Cheese is uniquely encased in a black wax coating and is an eclectic blue cheese created in 2002. With delicate notes including slightly milky with a hint of spiciness, Dragon’s Breath cheese pairs distinctly with sweet red wines like port and pairs perfectly with pears, and is a creative trophy to the Canadian Cheese landscape. A cheese this pronounced and served with dark chocolate combines two powerful flavours and while this recipe is simple and elegant, the addition of port poached pears acts as a middle man (or woman) between the two. With each bite of chocolate cake, poached pear, blue cheese and walnuts, your palate is ignited with layers of flavour and ecstasy. The pear is tart yet sweet, the chocolate is bitter yet rich, and the cheese is sharp yet subtle, creating a balanced harmony dessert that will impress any guest, or simply finish off a meal with elegance. No. 1 | Preheat your oven to 300°. Peel the pears, keeping the stem in tact and place them in a saucepan with cinnamon stick. Pour in the port and water, bring to a boil, then reduce to simmer and cover. Allow to poach for 45 minutes, or until cake is complete. No. 2 | Meanwhile, in a metal bowl set over a small pot of boiling water, melt the butter and chocolate. Remove from heat and stir in white sugar, cocoa powder, beaten eggs, vanilla, and salt. No. 3 | Pour the batter into a greased, 10” springform cake pan. Cook in the oven for 30 mins. The cake will look slightly underdone when you remove it. At the same time, remove the pears from the poaching liquid and set on a plate to cool. No. 4 | Allow the cake to cool for 10 minutes in the pan, then remove it from the pan and allow to cool completely on a wire rack. No. 5 | Using a 3” round cookie cut out, cut 4 rounds out of the cake and place each on their own dessert plate. Top with a tablespoon of Dragon’s Breath Blue, then place the pear on top of the cheese. Sprinkle with additional cheese and some chopped nuts. Thanks so much! They are definitely a romantic option. The whole recipe is delicious but I think I’ll be making the chocolate cake every week! Sooo good! I know, right? Thanks Maria! thanks so much for the recipe – this chocolate cake (really more like a brownie) IS THE BOMB! !